Dan Lepard is by far my favorite bread baker instructor, for many reasons, but perhaps the most important is that he doesn’t try to portray bread baking as a complicated and convoluted issue. It is flour, water, salt, and yeast, folks. Some bakers make you believe that you must go out of your way to get flour made from wheat harvested under a full moon when the temperature was 68.5 F. Or else… your bread will suffer horrible consequences. Others will have you frantically measuring the temperature of the air, the water, the bowl, your hands, the nose of your dog, then manipulate all those variables to find out for how long you must knead your dough to hit the jackpot of 78 F. Or else… your bread will suffer horrible consequences. Dan has a totally different approach, and you know what? None of his recipes has ever failed me. Because he turns bread baking into a light, fun experience, you’ll relax, bake more often, and get the real important achievement in the process: familiarity with the dough, a “feel” for when it’s been kneaded enough, proofed enough, baked enough. This is a wonderful example of Dan’s talent, a bread made with saffron and ricotta that smells amazing, and tastes even better! This is a very simple recipe, that doesn’t require a sourdough starter, a pre-ferment, or hours of commitment. All you’ll need is good quality saffron, some ricotta cheese, and flour, mostly all-purpose with a touch of spelt (or whole wheat). The saffron steeps in a bit of warm water, and that yellow, fragrant liquid is mixed with rapid rise yeast plus all other ingredients. Minimal kneading involved: three sessions of kneading lasting less than a minute each will produce a super smooth dough with tiny flecks of saffron poking through here and there. Using rapid rise yeast makes this bread show up at your table in less than 3 hours from the moment you start gathering your ingredients. I used an empty Le Creuset to bake this loaf: simply placed the slashed dough still over parchment paper inside the pre-heated Le Creuset (oven at 425F), closed the lid, and baked for 30 minutes. After 30 minutes I removed the lid and allowed the loaf to bake for 10 to 15 more minutes, until dark golden. If you want to see the complete recipe and print it, please click here. The bread has a beautiful yellow crumb, and if you freeze it and enjoy it later, slightly toasted, the taste of saffron gets much more pronounced. It also makes superb croutons for a Caesar salad. Baking in the Le Creuset produced a crust that was not too different from that of a rustic sourdough. I am definitely going to use this method often for non-sourdough breads, it traps the steam in a very efficient way, and the resulting crust is considerably better (for our taste, at least). I couldn’t agree more, most bread is quite easy to get in the pan. 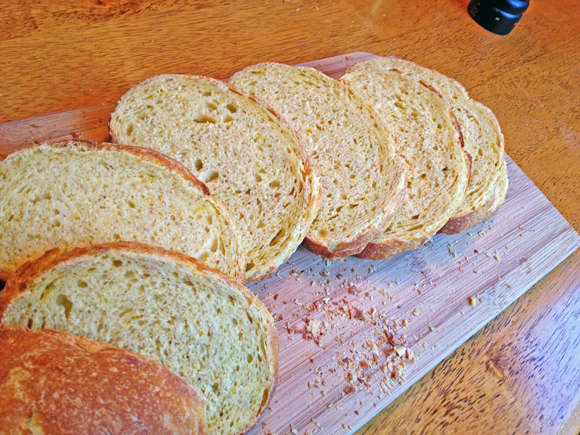 This bread sounds a teensy more complicated but wonderful! Have a great weekend?! Yup, jealous it is when I think about a saffron connection. I first was introduced to saffron in India, where it is used to flavor milk based desserts such as their version of rice pudding. I have yet to use it in bread that was not sweet and so am looking forward to trying Dan Lepard’s recipe! I had to laugh over your comments on the over complication of bread baking. Alright, I confess to having baked by all the methods you described. You forgot to add making sourdough cultures using the skins of only organic grapes! I too am a fan of Dan Lepard’s. I have gladly paid the extra fees to have books shipped to the U.S. from Amazon UK. Alright, I was only truly glad to pay the money once I had yet another of his excellent books in my hands. I thank you for posting the link to recipe in The Guardian. The question now is whether I can wait for his new book the article mentions or will I succumb yet again to paying international shipping???! I see you made an oval loaf shape. I have a large round Le Crueset. I was wondering if you could share the model or the dimensions of your pot? Is it a roaster of some kind? I would like to have the capability to make a longer loaf when using this technique. Thanks for the inspiration, the chuckles, and the baking joie de vivre! I should have taken a photo – the loaf sat nicely in the center – I bet you can do exactly the same with your round one, shaping the bread as a round thingie. Another beautiful loaf. My biggest LC oval is the 6.3 liter. Is that the size you used? The number 31 is 6.3 liters. What a gorgeous loaf of bread. Thanks for the tip about baking it in Le Creuset and giving the dimensions in the comments. 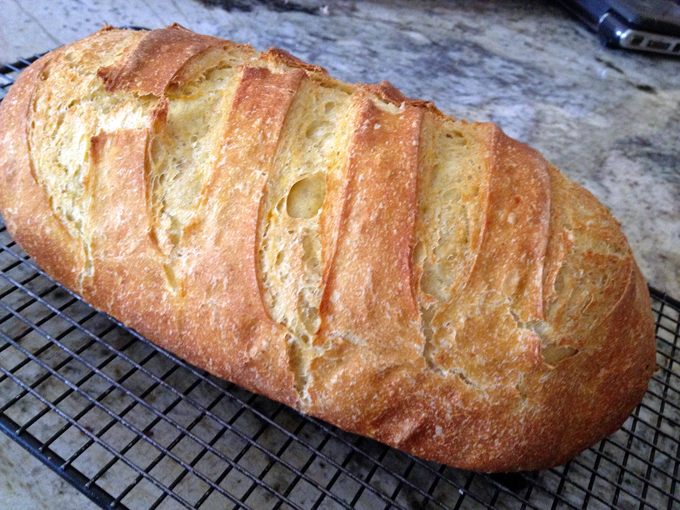 Oh my goodness Sally, I *love* the ingredients in this loaf….I wish above all that I could enjoy a piece of your gorgeous bread with you while we play with your doggies… jump through the sprinklers with them under the glistening sunshine ;-). Light and fun always works for me! (love your new profile pic) ♡. The nose of your dog…..you crack me up! A lovely looking loaf, I must say. Sally, don’t know if you’re aware of this or not, but the folks at Modernist Cuisine are in the planning stages of producing an encyclopedic collection of books on bread. Peter Reinhardt is one of the principals on the team. I think they’re looking for contributors. I don’t have the link on this computer, but if you Google Modernist Cuisine, you should find a direct link. Oh, and thanks for the Dan Lepard head’s up. Will be ordering his newest book. Went there and saw the link… very cool…. I hope Dan Lepard will be part of it! So, I hope my post makes you go for the Le Creuset baking, it really worked surprisingly well! Hahahha! I had to laugh out loud at your description here. I’m one of those that so scared of yeast and water reaction coz people make it sound scary and the whole checkig temp or water is just not my thing. Looks like I am about to be best friends with Dan Lepard! This loaf looks amazing. Sally, I just ordered The Handmade Loaf from Amazon UK. I went there because in the Amazon US reviews several reviewers pointed out that US publisher had changed the measurements by weight to volume, which drives me nuts, especially for breads. The UK edition is pricier (mostly because of shipping) but for me it’s worth the extra few dollars. Should have the book in about two weeks, and can hardly wait to start cooking from it. Your bread always looks so fantastic. Hopefully you’ve inspired people to try baking bread, if they never have. It really is easy, and you can add just about anything to the dough, which is my favorite part. Saffron and ricotta? Fabulous!!! Saffron and ricotta is indeed a great combo – and this bread absolutely delicious! I do feel quite jealous, Sally! Saffron is quite expensive and one of the best spices. 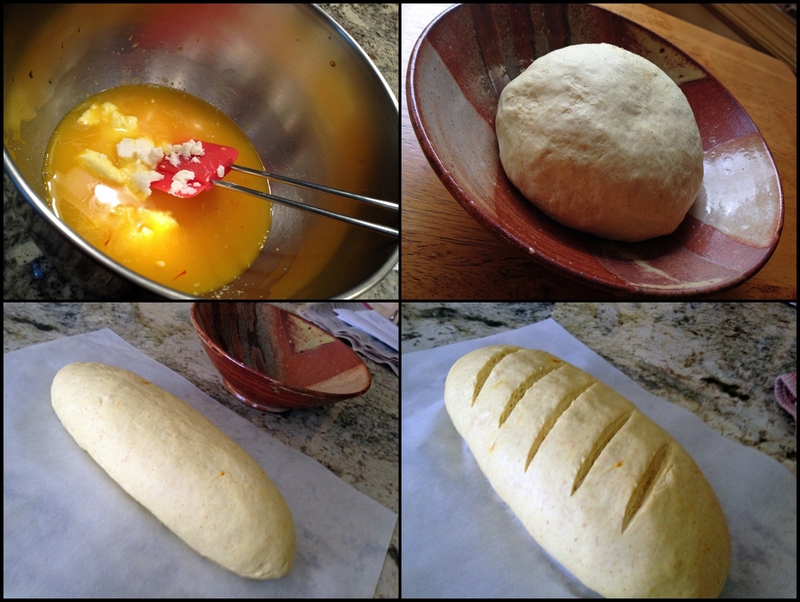 I wish I could have at least a large piece of this saffron-infused bread loaf! I am a big fan of bread baking by feel and not by measuring every single variable. I mean…our ancestors probably didn’t have digital thermometers to measure the temperature of all the things, and yet their loaves still turned out just fine! I don’t think I’ve ever seen ricotta in a yeast bread before but it has me pining for a slice of this gorgeous loaf! So true! No digital thermometers, no KitchenAids, no steam oven. What intrigued me about this bread is of course, the saffron. I might just try his recipe soon. It seem pretty manageable. Thank you so much! Glad you enjoyed the post….. hope you find more stuff that pleases you on my blog!